In a report on their findings, published in the August 8 issue of Proceedings of the National Academy of Sciences, the researchers say their work adds to scientific understanding of the way olfactory tissue recovers from damage triggered by viruses, toxic chemicals and gases, or allergens. "The kind of inflammation associated with immune system reactions to fight infection or injury appears to be part of a single system linked to tissue regeneration, so that normal healing of the olfactory system can't happen without it," says Andrew Lane, M.D., professor of otolaryngology-head and neck surgery at the Johns Hopkins University School of Medicine. "But more isn't always better, and continued inflammation will eventually have the opposite effect of killing olfactory neurons and inhibiting their regeneration, resulting in the loss of smell." Lane frequently sees patients with chronic sinusitis who've lost their sense of smell over time, and this has long been presumed to be due to the permanent destruction of olfactory tissue by inflammation and replacement with scar tissue. However, treating patients with oral steroids that suppress the immune system can bring back the sense of smell temporarily, suggesting that the olfactory tissue is still present in the nose, but that chronic inflammation plays a role in repressing its function. The researchers say that how this might occur has been a mystery. In the process of testing inflammation's role in damaging olfactory tissue, researchers gave a chemical, methimazole, to mice that directly damages their olfactory tissue, waited a day, then treated them with a steroid injection. They then biopsied the tissue to measure how many new olfactory basal stem cells were growing and dividing (healing), using BrdU as a marker of replicating DNA. Compared to mice not given the steroids, mice given steroids had 45 percent fewer stem cells proliferating to replace the damaged ones in the tissue, suggesting that suppressing inflammation slowed olfactory stem cell regeneration. Intrigued by this finding, the researchers then looked at levels of genes likely responsible for inflammation's effects on the olfactory stem cells of the mice given steroids versus those not treated. In mice not treated with steroids, they found double the gene product levels of the inflammatory molecules TNF-a and IL-1?. In the mice given steroids, they also detected the inflammatory messenger NF-kB in olfactory stem cells. "Not only is the presence of NF-kB in olfactory stem cells unexpected," says Lane, "but the fact it gets turned on by inflammation shows communication occurring between the immune system and the olfactory system to initiate healing." Since steroids can have other effects on tissue other than repressing inflammation, the researchers decided to use specifically bred mice that lacked inflammatory molecules. They used mice bred without the receptor that detects TNF-a, and they used mice that didn't have the gene for NF-kB in the olfactory stem cells. In both sets of mice, they damaged the olfactory tissue and observed the number of newly dividing stem cells in the tissue after two or three days. In both types of mice, the researchers measured greater than 50 percent fewer newly regenerating cells than normal mice with damaged olfactory tissue. 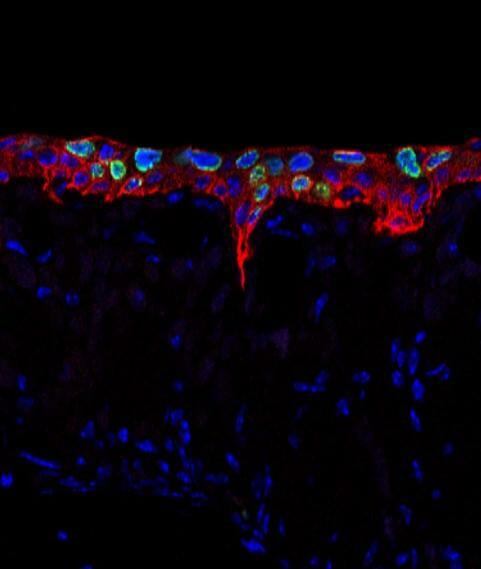 The researchers say this demonstrates on a molecular level how the immune system can talk to olfactory stem cells to begin the healing process after injury. "The sense of smell is often underappreciated," says Lane. "People without a sense of smell have a greatly reduced quality of life, which may be accompanied by depression. They can't enjoy food because the sense of smell is necessary to appreciate flavors, and they can't sense dangerous or offensive odors." Lane wants to figure out how to better trigger healing in the olfactory tissue so that sinusitis patients can regain their sense of smell more permanently without needing to take steroid pills. He also has plans to investigate drugs that will block inflammation in the olfactory tissue that becomes overactive in sinusitis. An estimated 29 million people in the U.S. have chronic sinusitis, according to the U.S. Centers for Disease Control and Prevention, and about two million people in the U.S. have lost their sense of smell. Other authors include Mengfei Chen and Randall Reed of Johns Hopkins University. The study was funded by grants from the National Institute on Deafness and Other Communication Disorders (R01 DC009026 and 5R56 DC008295) and the National Natural Science Foundation of China.